"Holocaust" and "Shoah" redirect here. For other uses, see Holocaust (disambiguation) and Shoah (disambiguation). 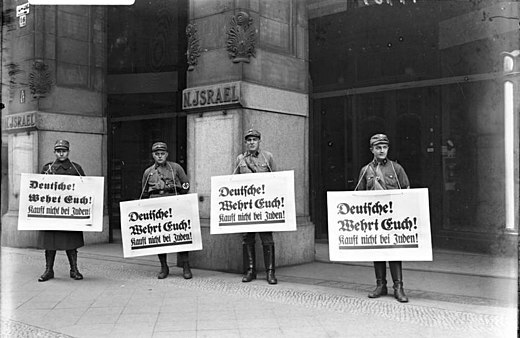 Germany implemented the persecution of the Jews in stages. Following Adolf Hitler's appointment as German Chancellor in January 1933, the regime built a network of concentration camps in Germany for political opponents and those deemed "undesirable", starting with Dachau on 22 March 1933. 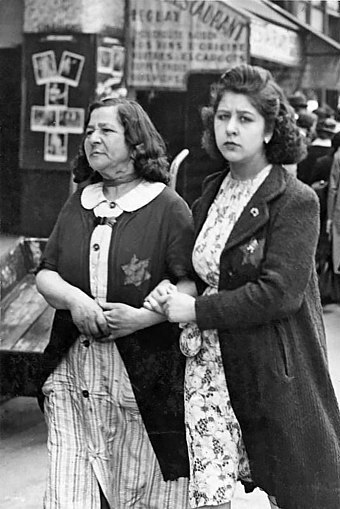 After the passing of the Enabling Act on 24 March,  which gave Hitler plenary powers, the government began isolating Jews from civil society, which included a boycott of Jewish businesses in April 1933 and enacting the Nuremberg Laws in September 1935. 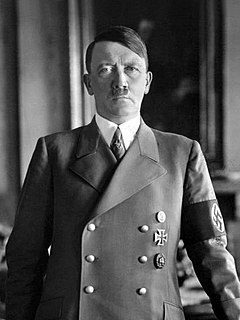 On 9–10 November 1938, during Kristallnacht (the "Night of Broken Glass"), Jewish businesses and other buildings were ransacked, smashed or set on fire throughout Germany and Austria, which Germany had annexed in March that year. After Germany invaded Poland in September 1939, triggering World War II, the regime set up ghettos to segregate Jews. Eventually thousands of camps and other detention sites were established across German-occupied Europe. The deportation of Jews to the ghettos culminated in the policy of extermination the Nazis called the "Final Solution to the Jewish Question", discussed by senior Nazi officials at the Wannsee Conference in Berlin in January 1942. As German forces captured territories in the East, all anti-Jewish measures were radicalized. 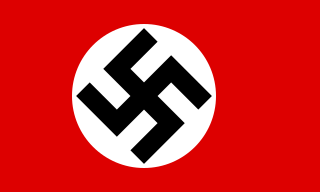 Under the coordination of the SS, with directions from the highest leadership of the Nazi Party, killings were committed within Germany itself, throughout occupied Europe, and across all territories controlled by the Axis powers. Paramilitary death squads called Einsatzgruppen , in cooperation with Wehrmacht police battalions and local collaborators, murdered around 1.3 million Jews in mass shootings between 1941 and 1945. 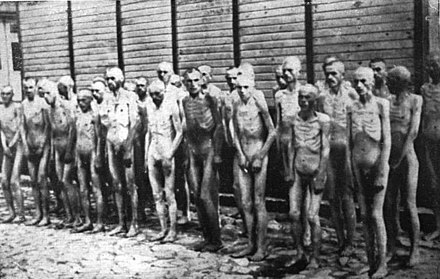 By mid-1942, victims were being deported from the ghettos in sealed freight trains to extermination camps where, if they survived the journey, they were killed in gas chambers. The killing continued until the end of World War II in Europe in May 1945. The Hamidian massacres, also referred to as the Armenian Massacres of 1894–1896 and Great Massacres, were massacres of Armenians in the Ottoman Empire that took place in the mid-1890s. It was estimated casualties ranged from 80,000 to 300,000, resulting in 50,000 orphaned children. The massacres are named after Sultan Abdul Hamid II, who, in his efforts to maintain the imperial domain of the collapsing Ottoman Empire, reasserted Pan-Islamism as a state ideology. Although the massacres were aimed mainly at the Armenians, they turned into indiscriminate anti-Christian pogroms in some cases, such as the Diyarbekir massacre, where, at least according to one contemporary source, up to 25,000 Assyrians were also killed. 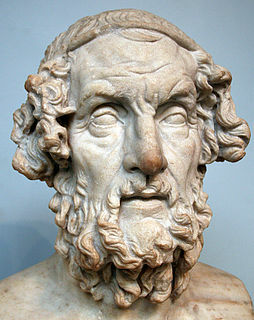 Romanization of Greek is the transliteration (letter-mapping) or transcription (sound-mapping) of text from the Greek alphabet into the Latin alphabet. The conventions for writing and romanizing Ancient Greek and Modern Greek differ markedly, which can create confusion. The sound of the English letter B was written as β in ancient Greek but is now written as the digraph μπ, while the modern β sounds like the English letter V instead. The Greek name Ἰωάννης became Johannes in Latin and then John in English, but in Greek itself has instead become Γιάννης; this might be written as Yannis, Jani, Ioannis, Yiannis, or Giannis, but not Giannes or Giannēs as it would have been in ancient Greek. The masculine Greek word Ἅγιος or Άγιος might variously appear as Hagiοs, Agios, Aghios, or Ayios, or simply be translated as "Holy" or "Saint" in English forms of Greek placenames. The American Hebrew was a weekly Jewish magazine published in New York City. The Bermuda Conference was an international conference between the United Kingdom and the United States held from April 19, 1943, through April 30, 1943, at Hamilton, Bermuda. The topic of discussion was the question of Jewish refugees who had been liberated by Allied forces and those who still remained in Nazi-occupied Europe. The only agreement made was that the war must be won against the Nazis. US immigration quotas were not raised nor was the British prohibition on Jewish refugees seeking refuge in the British Mandate of Palestine lifted. Kristallnacht or Reichskristallnacht, also referred to as the Night of Broken Glass, Reichspogromnacht[ˌʁaɪçs.poˈɡʁoːmnaχt] or simply Pogromnacht[poˈɡʁoːmnaχt](listen), and Novemberpogrome[noˈvɛmbɐpoɡʁoːmə](listen), was a pogrom against Jews throughout Nazi Germany on 9–10 November 1938, carried out by SA paramilitary forces and civilians. The German authorities looked on without intervening. The name Kristallnacht comes from the shards of broken glass that littered the streets after the windows of Jewish-owned stores, buildings, and synagogues were smashed. The poster reads: "60,000 RM is what this person with hereditary illness costs the community in his lifetime. Fellow citizen, that is your money too. Read Neues Volk , the monthly magazine of the Office of Racial Policy of the NSDAP." Jewish refugees from Czechoslovakia at Croydon airport, England, 31 March 1939. They were reportedly deported to Warsaw, occupied Poland, because their papers were not in order. Main ghettos: Białystok, Budapest, Kraków, Kovno, Łódź, Lvov, Riga, Vilna, Warsaw. One of the Sonderkommando photographs shows women being sent to the gas chamber, Auschwitz-Birkenau, August 1944. Another Stroop report image of the aftermath of the Warsaw Ghetto Uprising; the SS man on the right with the gun is Josef Blösche. Jews from the Tét ghetto in Hungary arrive at Auschwitz II, c. May 1944. Defendants in the dock at the Nuremberg trials, 1945–1946. ↑ Hebrew: השואה, HaShoah, "the catastrophe"
↑ "Deportation of Hungarian Jews". Timeline of Events. United States Holocaust Memorial Museum. Archived from the original on 25 November 2017. Retrieved 6 October 2017. 1 2 Landau 2016, p. 3. 1 2 3 4 5 "Documenting Numbers of Victims of the Holocaust and Nazi Persecution". United States Holocaust Memorial and Museum. 4 February 2019. Archived from the original on 9 March 2019. ↑ For the date, see Marcuse 2001 , p. 21. ↑ Crowe 2008, p. 1. ↑ Dawidowicz 1986, p. xxxvii. ↑ "Holocaust". Oxford Dictionaries. Oxford University Press. Archived from the original on 5 October 2017. Retrieved 4 October 2017. ↑ Whitney, William Dwight, ed. (1904). "Holocaust". The Century Dictionary and Cyclopedia . 4. Century. p. 2859. OCLC 222373761. ↑ Crowe 2008 , p. 1; "Holocaust" (PDF). Holocaust Resource Center, Yad Vashem. Archived (PDF) from the original on 5 February 2018. "The Holocaust: Definition and Preliminary Discussion". Holocaust Resource Center, Yad Vashem. Archived from the original on 26 June 2015. 1 2 3 Fischel 2010, p. 115. ↑ Meltzer, Julian (23 May 1943). "Palestine Zionists Find Outlook Dark". The New York Times. Archived from the original on 10 August 2018. ↑ Lustigman & Lustigman 1994, p. 111. ↑ Black 2016, p. 201. 1 2 Hilberg 2003, p. 1133. ↑ Fischel 1998, p. 46. ↑ Berenbaum 2006, p. xix. ↑ Brosnan, Matt (12 June 2018). "What Was The Holocaust?". Imperial War Museum. Archived from the original on 2 March 2019. Retrieved 2 March 2019. 1 2 Hayes 2015, pp. xiii–xiv. ↑ "Introduction to the Holocaust". Holocaust Encyclopedia. United States Holocaust Memorial Museum. Archived from the original on 1 October 2017. Retrieved 4 October 2017. ↑ "Senior Management Team: Dr. Michael Gray, Academic and Universities Director". Harrow School. Archived from the original on 27 March 2018. ↑ Gray 2015 , p. 4; "What Was the Holocaust?". United States Holocaust Memorial Museum. Archived from the original on 2 February 2019. 1 2 Gray 2015, p. 4. 1 2 Berenbaum 2006, p. 103. ↑ Arad 1987, pp. 154–159. ↑ "Gassing Operations". Holocaust Encyclopedia. United States Holocaust Memorial Museum. Archived from the original on 8 February 2015. Retrieved 25 January 2015. 1 2 3 "Killing Centers: An Overview". Holocaust Encyclopedia. United States Holocaust Memorial Museum. Archived from the original on 14 September 2017. Retrieved 30 September 2017. ↑ Lehnstaedt 2016, p. 30. ↑ Stone 2010, pp. 14–18. ↑ Bajohr & Pohl 2008 , p. 10, cited in Stone 2010 , p. 109. ↑ Niewyk & Nicosia 2000, pp. 229–230. 1 2 Fisher 2001, pp. 410–414. ↑ Hanauske-Abel 1996, p. 1453. 1 2 Müller-Hill 1999, p. 338. 1 2 Friedländer 2007, p. 505. ↑ Müller-Hill 1999, pp. 340–342. ↑ Müller-Hill 1999, p. 348. ↑ Lifton 2000, p. 358. ↑ Harran 2000, p. 384. ↑ Jones 2006, p. 148. ↑ Bergen 2016, pp. 14–17. ↑ Fischer 2002, pp. 47–49. 1 2 Evans 1989, pp. 69–70. ↑ "Antisemitism in History: World War I". Holocaust Encyclopedia. United States Holocaust Memorial Museum. Archived from the original on 9 September 2015. Retrieved 1 September 2015. ↑ Evans 2004, pp. 377–378. 1 2 Snyder 1976, p. 63. ↑ Yahil 1990, pp. 41–43. 1 2 Burleigh & Wippermann 1991, p. 78. 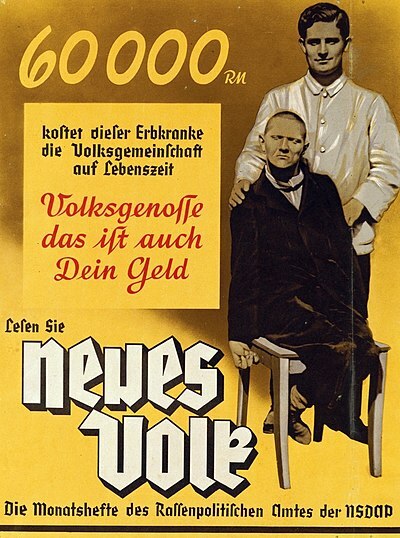 ↑ "Poster promoting the Nazi monthly publication Neues Volk". Artifact Gallery. United States Holocaust Memorial Museum. Archived from the original on 6 October 2017. Retrieved 5 October 2017. ↑ Lifton 2000, p. 21. ↑ Bloxham 2009, p. 171. 1 2 Niewyk & Nicosia 2000, p. 48. 1 2 Nuremberg Laws Archived 8 October 2017 at the Wayback Machine , Holocaust Encyclopedia, United States Holocaust Memorial Museum. Retrieved 7 October 2017. ↑ Arad, Gutman & Margaliot 2014, p. 78. 1 2 Gilbert 2001, p. 285. ↑ Fischel 1998, p. 20. ↑ Friedländer 1997, pp. 301–302. 1 2 Cesarani 2016, p. 183. ↑ Friedländer 1997, pp. 224–225. ↑ Friedländer 1997, pp. 62–63. ↑ Cesarani 2016, p. 382. ↑ Cesarani, David (17 February 2011). "From Persecution to Genocide". History: World Wars. BBC. Archived from the original on 22 October 2012. Retrieved 25 September 2012. ↑ Fischel 2010, p. 264. ↑ Chase 1999, p. xiii. ↑ Naimark 2001, p. 73. ↑ Browning 2004, pp. 81–85. ↑ Hildebrand 1984, p. 70. ↑ Crowe 2008, pp. 158–159. ↑ Bergen 2016, pp. 136–137. 1 2 3 4 5 Black 2016, p. 29. ↑ Browning 2004, pp. 111–113. ↑ Black 2016, pp. 29–30. ↑ Bergen 2016, p. 146. 1 2 Black 2016, p. 31. ↑ "Nisko and Lublin Plan" (PDF). Holocaust Resource Center. Yad Vashem. Archived (PDF) from the original on 7 March 2017. Retrieved 19 May 2018. ↑ Cesarani 2016, p. 264. ↑ Cesarani 2004, pp. 77–79. ↑ Cesarani 2004, pp. 259–260, 280, 288. ↑ Cesarani 2016, pp. 261–263. ↑ Cesarani 2004, p. 266. ↑ Longerich 2010, pp. 156–159. ↑ Edelheit 1994, p. 52. ↑ Cesarani 2016, p. 262. ↑ McKale 2002, p. 161. ↑ Bergen 2016, p. 169. ↑ McKale 2002, p. 162. ↑ McKale 2002, pp. 162–163. ↑ McKale 2002, p. 164. ↑ McKale 2002, pp. 165–166. ↑ Zuccotti 1993, p. 52. ↑ Bauer 2001, pp. 256–257. ↑ "Tunisia" (PDF). Shoah Resource Center. Yad Vashem. Archived (PDF) from the original on 25 March 2009. Retrieved 20 June 2017. 1 2 McKale 2002, pp. 192–193. 1 2 3 Black 2016, p. 134. 1 2 Black 2016, pp. 131–133. ↑ Friling, Ioanid & Ionesc 2004, pp. 125–126. ↑ Black 2016, pp. 137–139. ↑ Ochayon, Sheryl. "The Jews of Libya". The International School for Holocaust Studies. Yad Vashem. Archived from the original on 25 September 2013. Retrieved 1 September 2013. ↑ Black 2016, p. 140. ↑ Black 2016, p. 141. ↑ Black 2016, pp. 134–135. 1 2 Rozett & Spector 2013, p. 161. ↑ Black 2016, pp. 136–137. ↑ Black 2016, p. 135. ↑ Braham 2011 , p. 45; Berenbaum 2002 , p. 9. ↑ Rozett & Spector 2013, p. 274. ↑ Orth 2009, p. 181. 1 2 Baumel 2001, p. 135. ↑ Fischel 2010, pp. 50–52. ↑ "Nazi Camps". Holocaust Encyclopedia. United States Holocaust Memorial Museum. Archived from the original on 19 June 2018. Retrieved 5 July 2018. ↑ "Concentration Camp System: In Depth". Holocaust Encyclopedia. United States Holocaust Memorial Museum. Archived from the original on 6 July 2018. Retrieved 5 July 2018. 1 2 Wachsmann 2015, pp. 287–288. ↑ Longerich 2010, pp. 314–320. ↑ Black 2016, p. 76. ↑ Black 2016, p. 104. ↑ Rozett 1990, p. 1222. ↑ Wachsmann 2015, p. 347. ↑ Wachsmann 2015, pp. 125–127, 623. ↑ Yahil 1990, p. 134. ↑ Wachsmann 2015, p. 119. ↑ Harran 2000, p. 461. ↑ Browning 1986, pp. 345–348. ↑ Hilberg 2003, pp. 216–7. ↑ Yahil 1990, p. 166. ↑ Yahil 1990, p. 169. ↑ Longerich 2010, p. 161. ↑ Yahil 1990, p. 165. ↑ Bergen 2016, p. 148. ↑ Longerich 2010, p. 166. ↑ Trunk 1996, pp. 1–6. ↑ Hilberg 1993, p. 106. ↑ Hilberg 1993, p. 170. ↑ Bergen 2016, pp. 150–152. ↑ Hilberg 1980, p. 104. ↑ Bergen 2016, pp. 150–151. ↑ Berenbaum 2006, pp. 81–83. ↑ Hilberg 1993, p. 109. ↑ Berenbaum 2006, pp. 79–81. ↑ Hilberg 2003, p. 1111. ↑ Snyder 2010, p. 285. 1 2 Berenbaum 2006, p. 114. ↑ Dwork & van Pelt 2003, p. 239. ↑ Dwork & van Pelt 2003, pp. 242–243. 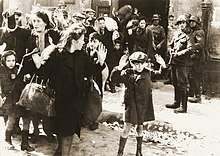 1 2 "Deportations to and from the Warsaw Ghetto". Holocaust Encyclopedia. United States Holocaust Memorial Museum. Archived from the original on 21 September 2012. Retrieved 27 September 2012. ↑ Yahil 1990, p. 378. ↑ Yahil 1990, pp. 378–380. ↑ Yahil 1990, pp. 382–385. ↑ Yahil 1990, pp. 474–478. ↑ Berenbaum 2006, pp. 175–177. ↑ Bergen 2016, p. 195. ↑ Dwork & van Pelt 2003, pp. 267–272. ↑ Friling, Ioanid & Ionesc 2004, p. 126. ↑ Friling, Ioanid & Ionesc 2004, p. 150. ↑ Dwork & van Pelt 2003, p. 272. ↑ Dwork & van Pelt 2003, p. 269. 1 2 Longerich 2010, p. 194. ↑ Amar 2015, p. 99. ↑ Gross 2002, cited in Longerich 2010 , p. 196. ↑ Polonsky & Michlic 2004, p. xiii. ↑ Burleigh 2001, pp. 512, 526–527. 1 2 Matthäus 2004, p. 268. ↑ Matthäus 2004, p. 275. ↑ Matthäus 2004, pp. 275–276. ↑ Matthäus 2004, pp. 270–271. ↑ Browning 2004, pp. 224–225. ↑ Hilberg 2003, p. 291. ↑ Fischel 2010, p. 67. ↑ Bergen 2016, pp. 199–200. ↑ Evans 2008, pp. 226–227. ↑ Bergen 2016, p. 199. ↑ McKale 2002, p. 203. ↑ Fritz 2011, pp. 102–104. ↑ Bergen 2016, p. 200. ↑ Fischel 1998, pp. 42–43. ↑ Bergen 2016, p. 160. ↑ Gerlach 2016, p. 74. ↑ Cesarani 2016, p. 513. ↑ Arad 2009, p. 138. 1 2 3 4 5 6 7 Original: "Besprechungsprotokoll" (PDF). Haus der Wannsee-Konferenz. Archived (PDF) from the original on 2 February 2019. English: "Wannsee Protocol, January 20, 1942". The Avalon Project. Yale Law School. Archived from the original on 16 August 2018. German: "Wannsee-Protokoll". EuroDocs. Harold B. Lee Library, Brigham Young University. Archived from the original on 22 June 2006. ↑ Gerlach 1998 , p. 759; "Wannsee Conference and the 'Final Solution'". Holocaust Encyclopedia. United States Holocaust Memorial Museum. Archived from the original on 28 September 2017. ↑ Gerlach 1998, p. 764. ↑ Gerlach 2016 , p. 80; for "Gauleiters", see Dwork & van Pelt 2003 , p. 279. 1 2 Gerlach 2016, p. 80. ↑ Dwork & van Pelt 2003, p. 279. ↑ Gerlach 1998, p. 122. ↑ Longerich 2010, p. 306. ↑ Gerlach 2016, pp. 84–85. 1 2 Longerich 2010, p. 307. 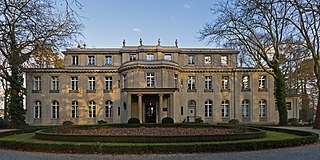 ↑ "Wannsee-Protokoll". EuroDocs. Harold B. Lee Library, Brigham Young University. Archived from the original on 22 June 2006. ↑ Longerich 2010, p. 308. ↑ Jones 2006, p. 153. ↑ "Treblinka". Holocaust Encyclopedia. United States Holocaust Memorial Museum. Archived from the original on 14 September 2017. "Aktion Reinhard" (PDF). Holocaust Resource Center. Yad Vashem. Archived (PDF) from the original on 11 March 2017. Retrieved 29 May 2017. ↑ Gerlach 2016, p. 99. ↑ Gerlach 2016, p. 99, note 165. ↑ Montague 2012, pp. 14–16, 64–65. ↑ Black 2016, pp. 70–71. ↑ Fischel 2010, pp. 57–58. ↑ Fischel 1998, p. 81. ↑ Longerich 2010, p. 282. ↑ Fischel 1998, pp. 81–85. 1 2 Black 2016, pp. 69–70. ↑ Crowe 2008 , p. 243; Arad 1987 , p. 98. 1 2 Fischel 1998, pp. 81–82. ↑ Bauer 1994, p. 156. ↑ Dwork & van Pelt 2003, pp. 287–288. ↑ Piper 1998b, p. 173. ↑ Montague 2012, pp. 76–85. 1 2 "Auschwitz-Birkenau Extermination Camp". About the Holocaust. Yad Vashem. Archived from the original on 5 October 2017. Retrieved 2 October 2017. 1 2 "Belzec" (PDF). Holocaust Resource Center. Yad Vashem. Archived (PDF) from the original on 6 October 2014. Retrieved 29 May 2017. 1 2 3 "Chelmno" (PDF). Holocaust Resource Center. Yad Vashem. Archived (PDF) from the original on 1 February 2017. Retrieved 29 May 2017. 1 2 "Majdanek" (PDF). Holocaust Resource Center. Yad Vashem. Archived (PDF) from the original on 27 November 2007. Retrieved 29 May 2017. ↑ "Maly Trostinets" (PDF). Holocaust Resource Center. Yad Vashem. Archived (PDF) from the original on 3 June 2013. Retrieved 29 May 2017. 1 2 "Sobibor" (PDF). Holocaust Resource Center. Yad Vashem. Archived (PDF) from the original on 23 January 2014. Retrieved 29 May 2017. ↑ "Treblinka" (PDF). Holocaust Resource Center. Yad Vashem. Retrieved 29 May 2017. ↑ Piper 1998b, p. 162. ↑ Piper 1998b, p. 157. ↑ Piper 1998b, p. 170. ↑ Piper 1998b, p. 163. ↑ Piper 1998b, pp. 170–171. ↑ Piper 1998b, p. 172. ↑ Piper 1998b, pp. 163–164. ↑ Fischel 1998, pp. 83–84. ↑ Fischel 1998, pp. 84–85. ↑ Longerich 2010, p. 330. ↑ Arad 1987, pp. 170–171. ↑ "Jews captured by Waffen SS soldiers during the suppression of the Warsaw Ghetto Uprising". Yad Vashem. Archived from the original on 9 October 2014. ↑ Longerich 2010, pp. 340–341. ↑ Hilberg 2003, pp. 1112–1128. ↑ Bauer 1997, p. 117. ↑ Hilberg 1996, pp. 126–137. ↑ Snyder 2010 , p. 283; Longerich 2010 , p. 341. ↑ Black 2016, pp. 82–85. ↑ Black 2016, pp. 83–84. ↑ Gutman 1994, p. 243. 1 2 Bergen 2016, p. 269. ↑ Cesarani 2016, p. 616. ↑ Cesarani 2016, p. 636. ↑ Arad 1987, pp. 286, 293–294. ↑ Fischel 1998, p. 99. ↑ Fischel 1998, pp. 95–96. ↑ Fischel 1998, p. 98. ↑ Arad 1987, p. 337. ↑ Arad 1987 , p. 341; Fischel 1998 , p. 98. ↑ Langbein 1998, pp. 500–501. ↑ Kennedy 2007, p. 780. 1 2 Fischel 1998, pp. 100–101. ↑ Cesarani 2016, p. 648. ↑ Tec 2001, p. 546. ↑ Snyder 2010, p. 302. ↑ Bergen 2016, p. 273. ↑ Zuccotti 1993, p. 274. ↑ Zuccotti 1993, p. 275. ↑ "Jewish Soldiers in the Allied Armies". About the Holocaust. Yad Vashem. Archived from the original on 30 March 2017. Retrieved 29 May 2017. ↑ Laqueur 2001, p. 351. 1 2 Fleming 2014a, p. 35. ↑ Bartrop 2016 , p. 210; Fleming 2014b , p. 131. 1 2 Spector 1990, p. 158. ↑ "Grojanowski Report" (PDF). Shoah Resource Center. Yad Vashem. Archived (PDF) from the original on 6 February 2012. Retrieved 1 September 2012. ↑ Crowe 2008 , p. 354; Niewyk & Nicosia 2000 , p. 183. ↑ Lukas 2012, p. 159. ↑ Niewyk & Nicosia 2000, p. 183. ↑ Fleming 2014a , p. 35; Fleming 2014b , p. 144. ↑ Fleming 2014a, pp. 35–36. ↑ Zimmerman 2015, p. 181. ↑ Zimmerman 2015, pp. 181–182. ↑ Zimmerman 2015, p. 182. ↑ "11 Allies Condemn Nazi War on Jews". The New York Times. 18 December 1942. (Subscription required (help)). Frankel, Max (14 November 2001). "150th Anniversary: 1851–2001; Turning Away From the Holocaust". The New York Times. Archived from the original on 23 December 2017. Retrieved 20 December 2017. ↑ Thomson, Mike (13 November 2012). "Could the BBC have done more to help Hungarian Jews?". BBC News. Archived from the original on 22 July 2018. Also see Fleming 2014b , p. 368, note 4, who cites Thomson. ↑ Novick 2000, pp. 27–28. ↑ Friedländer 2010, p. 23. 1 2 Dwork & van Pelt 2003, pp. 256–257. ↑ Longerich 2010, pp. 330–339, 375–379. ↑ "Aktion 'Erntefest' (Operation 'Harvest Festival')". Holocaust Encyclopedia. United States Holocaust Memorial Museum. Archived from the original on 10 March 2017. Retrieved 29 May 2017. ↑ Longerich 2010, pp. 360–373, 386–389, 390–396. ↑ Longerich 2010, pp. 345–353. ↑ Longerich 2010, pp. 352–353. ↑ Yahil 1990, pp. 376–378. ↑ Kwiet 2004, pp. 61, 69–71, 76–77. ↑ Kwiet 2004, pp. 77–78. ↑ Fischer 1998, pp. 536–538. ↑ Black 2016, p. 108. ↑ "Killing Centers". Holocaust Encyclopedia. United States Holocaust Memorial Museum. Archived from the original on 6 May 2017. Retrieved 29 May 2017. ↑ Evans 2002, p. 95. 1 2 Braham 2011, p. 45. ↑ Longerich 2010, p. 408. ↑ "Deportation of Hungarian Jews" Archived 25 November 2017 at the Wayback Machine , United States Holocaust Memorial Museum. Retrieved 5 October 2017. ↑ Fischel 2010, pp. 31, 76–77. ↑ Löb 2009, p. 69, citing "A Monstrous 'Offer'", The Times, 20 July 1944. ↑ Black 2016, pp. 107–109. ↑ Weinberg 2001, p. 219. 1 2 Polonsky 2001, p. 488. ↑ Longerich 2012, p. 695. ↑ Bergen 2016, pp. 290–292. ↑ Longerich 2010, pp. 410–412. 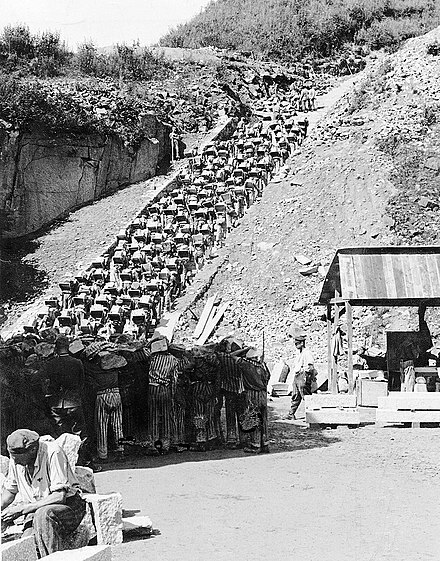 ↑ "Map of the Death Marches". Holocaust Encyclopedia. United States Holocaust Memorial Museum. Archived from the original on 16 August 2012. Retrieved 1 September 2012. ↑ Friedländer 2007, pp. 648–650. ↑ Niewyk & Nicosia 2000, p. 165. ↑ Longerich 2010, p. 411. ↑ Hitchcock 2008, p. 283. ↑ Hitchcock 2008, p. 297. ↑ Hitchcock 2008, p. 340. ↑ Gilbert 1985, p. 798. ↑ Wachsmann 2015, p. 577. ↑ Gilbert 1985, pp. 808–809. ↑ Gilbert 1985, p. 810. ↑ Cesarani 2016, p. 762. ↑ Hitchcock 2008, p. 289. ↑ "The 11th Armoured Division (Great Britain)". Holocaust Encyclopedia. United States Holocaust Memorial Museum. Archived from the original on 16 August 2012. Retrieved 1 September 2012. 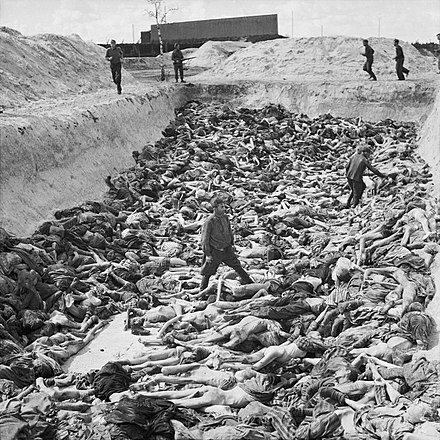 ↑ "Bergen-Belsen". Holocaust Encyclopedia. United States Holocaust Memorial Museum. Archived from the original on 15 August 2012. Retrieved 1 September 2012. ↑ Bell 2017, p. 100. ↑ Dimbleby, Richard (15 April 1945). "Liberation of Belsen" Archived 13 February 2009 at the Wayback Machine . BBC News. Retrieved September 2012. "Richard Dimbleby reporting from Bergen-Belsen", part 1/2 Archived 1 February 2018 at the Wayback Machine , part 2/2 Archived 9 October 2014 at the Wayback Machine , BBC News, courtesy of YouTube. ↑ Hayes 2015, p. xii. 1 2 Michman 2012, p. 197. ↑ Bauer & Rozett 1990, p. 1797. 1 2 Dawidowicz 1986, p. 403. ↑ Bauer & Rozett 1990, p. 1799. ↑ Gilbert 2001, p. 245. ↑ "Children during the Holocaust". United States Holocaust Memorial Museum. Archived from the original on 9 October 2017. ↑ Fischel 1998 , p. 87; Bauer & Rozett 1990 , p. 1799. ↑ Bauer & Rozett 1990, pp. 1799–1802. ↑ Niewyk & Nicosia 2000, pp. 221–222. ↑ Rhodes 2002, p. 274. ↑ Black 2016, pp. 29–31. ↑ Piper 2000 , pp. 230–231; Piper 1998a , p. 62. ↑ "Treblinka". Holocaust Encyclopedia. United States Holocaust Memorial Museum. Archived from the original on 17 May 2017. Retrieved 11 June 2017. ↑ "Belzec". Holocaust Encyclopedia. United States Holocaust Memorial Museum. Archived from the original on 10 July 2017. Retrieved 11 June 2017. ↑ "Chelmno". Holocaust Encyclopedia. United States Holocaust Memorial Museum. Archived from the original on 28 August 2017. Retrieved 11 June 2017. ↑ "Sobibor". Holocaust Encyclopedia. United States Holocaust Memorial Museum. Archived from the original on 29 May 2017. Retrieved 11 June 2017. 1 2 Berenbaum 2006, p. 125. 1 2 "Polish Victims". Holocaust Encyclopedia. United States Holocaust Memorial Museum. Archived from the original on 7 May 2016. Retrieved 1 June 2016. 1 2 "Jehovah's Witnesses". Holocaust Encyclopedia. United States Holocaust Memorial Museum. Archived from the original on 11 April 2017. Retrieved 29 June 2017. 1 2 Milton 2001, p. 350. 1 2 3 "Persecution of Homosexuals in the Third Reich". Holocaust Encyclopedia. United States Holocaust Memorial Museum. Archived from the original on 12 June 2018. ↑ Huttenbach 2016, p. 31. 1 2 Niewyk & Nicosia 2000, p. 47. ↑ Bauer 1998, p. 453. ↑ Bauer 1998 , p. 444; also see Longerich 2010 , p. 50. ↑ Bauer 1998, p. 445. ↑ Bauer 1998, p. 446. ↑ Evans 2015a, pp. 378–379. ↑ "Genocide of European Roma (Gypsies)". Holocaust Encyclopedia. United States Holocaust Memorial Museum. Archived from the original on 2 September 2012. Retrieved 1 September 2012. ↑ Hancock 2004, pp. 383–96. 1 2 3 Longerich 2010, pp. 418–421. ↑ Bloxham 2009, p. 114. ↑ Bloxham 2009, p. 119. ↑ Evans 2008 , pp. 174–175; Snyder 1976 , p. 359. ↑ Michael Geyer (2009). Beyond Totalitarianism: Stalinism and Nazism Compared. Cambridge University Press. pp. 152–153. ISBN 978-0-521-89796-9. ↑ Gellately 2001, p. 153. ↑ Berghahn 1999, pp. 32–33. ↑ Longerich 2012 , pp. 450–452; Fritz 2011 , p. 23. ↑ Mazower 2008, pp. 204–205. ↑ Mazower 2008, pp. 208–211. ↑ Bloxham 2009, p. 112. 1 2 Piotrowski 1998, p. 295. ↑ Szafranski 1960, p. 43. ↑ Szafranski 1960, p. 49.